Sam Gagner On The Move? 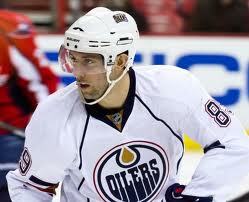 Edmonton Oilers Center Sam Gagner has been rumored to have been on the move for a while. Many thought he’d go to Buffalo and many thought otherwise. Regardless of what team he ends up on TSN reports that the Oilers would like a top-six forward, top-four defenseman or a starting goaltender. In my opinion that’s a little too much for an undersized top-six forward but a deal still may be able to come through considering some team’s need of goal scoring. The 26 year old who was drafted 6th overall in the 2007 NHL Entry Draft has shown to be a talented playmaker as in his rookie season in the 2007-08 season he scored 13 goals, made 36 assists and finished with 49 points. Next Post Tim Murray To Be Hired By Sabres?